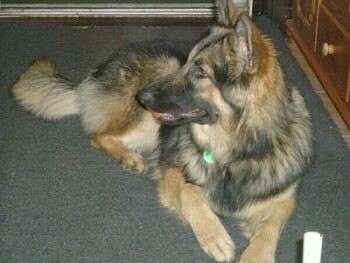 "This is Layla at almost 2 years old. She is a Pit Bull / Dogo Argentino mix. She's about 66-70 lbs., very hyper, loves to run, go for walks, chase everything (squirrels, rabbits, leaves, sticks, turtles, frogs, bugs, shadows/reflections!!!). You name it or see it and she's chasing it. Loves to play with every one and everything, even our cats!!! She definitely does not know her own size. She thinks SHE'S a cat!!! Or a lap dog!!! She loves to lick and to give you her paw. She is very good with other dogs and is a neighborhood favorite who visits the nearby neighbors and their pets and children, and is very loved by everyone. Very sociable and loves to be outdoors. She is rambunctious though, and definitely does not care what is in her way when she is on the move. Very good dog, housetrained and crate-trained, very good with children, adults and other dogs and makes me happy every day to see her puppy face and her sweet personality." Clyde, a mottled tri-color Border Collie mix—"Clyde is a rescue from an irresponsible family. After the death of our St. Bernard to cancer, I felt the time was right to get a new companion. Being addicted to Cesar Millan's show, I started using his methods. With practice and patience, it works. Clyde is very balanced...very good with cats, dogs, chickens, and sometimes horses. He loves all people and is very affectionate. He loves Frisbee and playing fetch with tennis balls. We also rescued his sister, Bonnie 2 days after getting Clyde. She is all black with ticking on the toes, tail, neck and chest. Clyde is lean, fast, agile, strong, and smart. I love my dogs, very proud of them, and thankful to Cesar for showing me how to raise two balanced dogs." Casey is a 15-month-old Staffordshire / Pit-Bull Terriercross. She is very active and strong, enjoys meeting new people and loves a good old rough and tumble with other dogs and family members. She adores her cuddles and is very much loved and spoilt on a daily basis. She is very loyal towards her family and guarded towards strangers near the house. Snowball, an American White Shepherd / Husky / Malamute mix—the shelter did not know much about his history but he is a perfect dog. He is kind to everyone and he is just full of energy and loves agility. Sami is a Kelpie / Shepherd mix. She was named after her owner's favorite villainess, Sami Brady from the Days of Our Lives. Her owner states, "We rescued her from the shelter when she was about a year old (2002) and was a gift for my daughter's first birthday. They are inseparable. She is the most loving dog I've ever known, and loves to run and swim at dog beach (San Diego, where this picture was taken). We are lucky to have found her."